Instead of facing the oh-so-difficult choice between pesto sauce or a creamy sauce for pasta, enrich store-bought pesto from a jar with buttery, cheesy or creamy ingredients. You can then enjoy the flavors and textures of both. Blending a custom sauce in this manner combines the ease of using a jarred sauce with the satisfaction of adding your own culinary twist to a pantry standby. It's also economical, making a jar of pesto -- which can be relatively pricey -- go further and last longer. Spoon pesto sauce from a jar into a saucepan and turn the heat to medium. Pour heavy cream into the saucepan with the pesto. 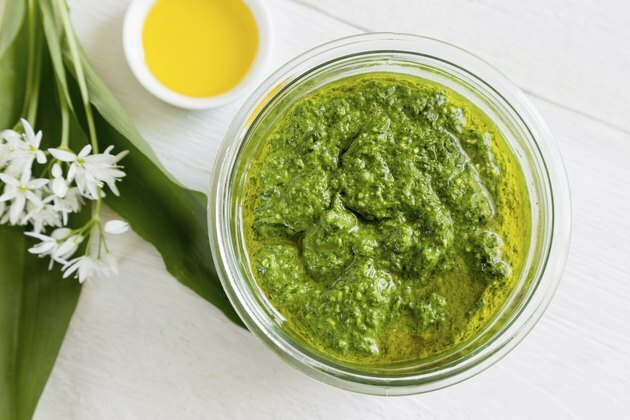 Use less cream than pesto, equal amounts of both, or more cream than pesto, depending on the blend of flavors you desire. Add a knob of butter -- a walnut-size chunk -- to the mixture if you want the sauce to be extra rich. Stir the pesto and cream together with a wooden spoon until they are thoroughly blended. Taste the sauce and add more cream or more pesto if you want to adjust the blend. Stir the sauce until it's warmed through and barely simmering, but don't let it boil vigorously. Cut a piece of cream cheese into small cubes and add them to the pan with the pesto. Add a few tablespoons of milk to the pan. Stir until the cheese melts and blends with the pesto and milk. Add more milk to the pan and stir, if the sauce seems too thick. Stir the sauce over the heat until it's just starting to bubble. Heat a small amount of butter, olive oil or a blend of both over medium-low heat in a saucepan. Optionally saute finely chopped onion and minced garlic in the butter or oil until translucent. Add a few teaspoons of plain flour to the butter or oil, and stir with a wooden spoon to make a smooth paste. Add more flour, a few teaspoons at a time, and stir into the butter or oil until you have a slightly crumbly, dough-like mixture. This is called a roux. Stir the roux constantly over medium-low heat for a few minutes. You should see it darken slightly. Stir milk into the roux, a splash or two at a time, stirring vigorously to blend without any lumps. Keep adding milk and stirring until the sauce has the consistency of heavy cream. Turn the heat to medium and stir the sauce continuously until it bubbles and thickens. Stir pesto from a jar into the bechamel sauce until blended. Grate Parmesan cheese into the sauce if you wish. Spoon pesto from a jar into a saucepan. Turn the heat to medium. Spoon creamy jarred sauce, such as alfredo, into the pesto. Stir the two sauces together until blended, warmed through and just starting to simmer. Experiment with different proportions of pesto and creamy ingredients to get a taste and texture combination that you like. Taste the sauce as you make it and add more or less pesto according to your personal tastes. If you end up with too much sauce, refrigerate or freeze the leftovers for another meal. Substitute coconut cream or coconut milk for dairy cream or milk for a different flavor.